LIMA--FOR seven weeks tens of thousands of Amazonian Indians blocked roads and rivers across eastern Peru. They seized hydroelectric plants and pumping stations on oil and gas pipelines to try to force the repeal of decrees facilitating oil exploration, commercial farming and logging in parts of the jungle. 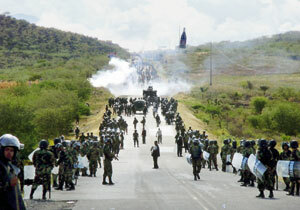 Petroperu, the state oil company, had to shut a pipeline that carries 40,000 barrels of oil each day. Amid threats of energy rationing in eastern towns, the government of President Alan García this month ordered armed police to clear a stretch of road and retake a pumping station near Bagua, in Peru's northern jungle (see map). In the ensuing clash at Curva del Diablo--or "Devil's Curve"--on June 5th at least nine protesters and eleven police were killed. The Indians, armed with spears and machetes, went on to capture and kill a dozen more police guarding a pumping station. Their leaders claim that at least 40 Indians were killed and 60 more are missing, though these numbers have not been confirmed. This bloody confrontation has rocked Mr García's government--and dramatised the failure of Peru's political system to settle the conflict between the government's plans for development and the demands of some of its poorest citizens. Thousands of Indians brandishing wooden spears continued to block roads near Bagua this week. The government imposed a curfew and placed the army in charge of two provinces in Amazonas department. It has sent police reinforcements to other parts of the jungle and ordered the arrest of Alberto Pizango, the leader of AIDESEP, an umbrella-group of jungle-Indian peoples that organised the protests. Mr Pizango last month briefly called for an "insurgency" against the government, raising alarm in a country that suffered greatly from the terrorist violence of the Shining Path in the 1980s and 1990s. He has sought and been granted asylum in Nicaragua. Mr García has hinted that radical socialist governments in Venezuela and Bolivia were behind the violence, and were manipulating "ignorant" Indians. While not endorsing AIDESEP's violent tactics, many Peruvians blame Mr García for the violence. El Comercio, Peru's establishment newspaper, echoed opposition calls for the sacking of Yehude Simon, the prime minister, and of the interior minister for bungling the dispute. The government is widely condemned for failing to consult properly over 99 decrees it issued a year ago, using legislative powers delegated by Congress. These decrees were ostensibly designed to speed the implementation of a free-trade agreement with the United States, but trade had little to do with the new rules that AIDESEP objects to. After a first wave of protests by AIDESEP last August, Peru's Congress repealed two decrees which would have made it easier for Indian communal lands to be sold. But congressional leaders failed to conduct a promised review of eight other decrees, prompting a renewal of protests in April. These measures introduce provisions allowing the development of "unproductive" land in the jungle. The recent blocking by Mr García's APRA party of an attempt to repeal one of the eight measures, the forestry and wildlife law, triggered the violence. However, on June 10th Congress voted to suspend temporarily two of the decrees. Mr García argues that the Indians should not be allowed to block investment in oil and gas that he hopes will turn the country into an oil exporter, benefiting all Peruvians. AIDESEP counters that his decrees ride roughshod over the property rights of the Indians. Peru has some 70m hectares (173m acres) of rainforest--the largest chunk of the Amazon basin outside Brazil. Around 70% of the jungle has now been granted, or offered, as concessions for oil and gas exploration, much of it by Mr García's government. Foreign oil companies, including Spain's Repsol, and dozens of smaller outfits, are operating many of these concessions. Much of the land is claimed either as communal by Indian tribes or as private property. One hotly disputed area involves Lot 67, a concession in Loreto in the north-eastern jungle. Perenco, an Anglo-French company, plans to invest up to $2 billion by 2013 to extract 100,000 barrels per day of heavy oil. This partly overlaps a proposed reserve for an Indian tribe that eschews contact with the modern world. AIDESEP complains that governments have been slow to settle Indian land claims and grant titles, and quick to grant concessions to oil companies and loggers. This makes Indians suspicious and resentful. Some 330,000 of them, grouped in 60 different tribes, live in the Peruvian jungle (where they make up 10% of the population). Many have not joined the protests. Most lack adequate schools and health clinics. More than half the population of the northern jungle is poor, compared with a national average of 36%. Peru has seen many conflicts between foreign mining and oil companies and local people, who complain of environmental damage and/or a lack of tangible benefits from these investments. The conflicts are often resolved only after protests, and sometimes bloodshed. AIDESEP says that under the UN declaration on indigenous peoples, which Peru voted for, its member groups have the right to exercise control over their traditional lands and their resources. The problem for Peru is that there is no agreement about how to apply such rights or how to square them with the interests of the rest of the population. Force is not the answer. Instead of bluster, Mr García should be offering Peru proper consultation and vigorous debate about these issues.